Our knowledge of one-dimensional superconductivity to date is based on studies of nanowires just a few microns long. MRSEC researchers have now measured charge transport in an Indium- Gallium nanowire that is 150 nm across and exceptionally long: 6 millimeters. 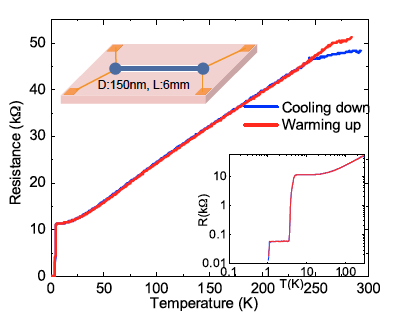 Protected within a hollow glass fiber, the nanowire shows an unusual superconducting transition, with steps at both 5K and 1.1K (close to Tc of pure Ga). Magneto-resistance shows vertical hysteresis loops, suggesting that magnetic fluxons of a single quantum are trapped in droplets of Ga comparable in size to the diameter of the wire. These droplets are surrounded and separated from each other by longer sections of In-Ga eutectic with higher Tc and Hc. Never before has a single superconducting nanowire this narrow been made so long: this new physical regime promises new physics.